"There's an archetypal superhero that is built around Superman - the big guy in the cape, basically. Supreme was intended to be Image's version of Superman done right." "Superman himself seems to have been a bit lost for a number of years, it's not the character I remember. What made the character appealing to me has been stripped away in a tide of revisionism. Given that I was somebody who sort of helped bring in the trend of revisionism in comics, I've got to take some of the blame for that. But it seems to me that there might have been a case of the baby being thrown out with the bathwater with the original Superman." "What it was with Superman was the incredible range of imagination on display. A lot of those concepts that were attached to Superman, which may seem corny and dated to some, were wonderful. 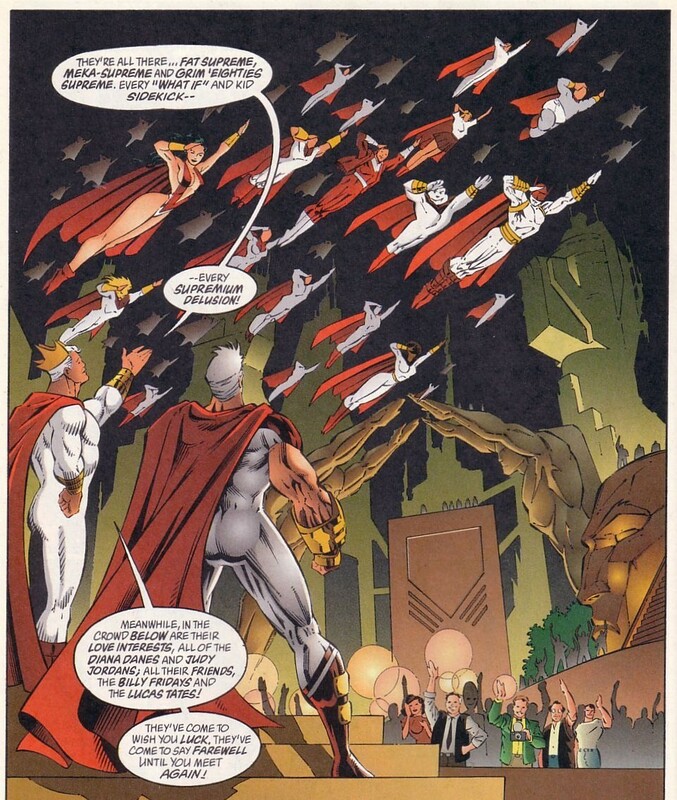 The idea of the Bottled City of Kandor, Krypto the Superdog, Bizarro, all of it. These are fantastic ideas, and it was that which kept me going back each month to Superman when I was ten. I wanted to find out more about this incredible world with all of these fascinating details." "What I decided to do was recreate that sense of richness, something that had the same range and splendor as the original Superman mythos." "The Lost Issues of Supreme"
After a brief hiatus, Awesome Comics has announced their plans to move ahead with a new publishing schedule. "We're excited to be back on track and we look forward to getting back in the game," says Awesome Marketing Director Matt Hawkins. "While the hiatus period that we are now emerging from has been both frustrating and problematic, we are confident that the fans and retailers will respond positively to our schedule as we move forward." Awesome Adventures is the tentative title of a new series with a magazine style format that will feature the vast library of Alan Moore material in Awesome's possession. "There are nearly two dozen issues of Supreme, Youngblood, Glory and Warchild that we purchased from Alan and we intend to publish these stories along with the artwork that was commissioned by Steve Skroce, Brandon Peterson and Chris Sprouse in this exciting new format. "Alan's genius deserves to be shared with his vast audience and we believe that this new format is the most effective way of satisfying their appetite. Awesome Adventures will feature a rotation of Supreme, Youngblood, Glory and Warchild, much the same way Heavy Metal and Frank Frazetta's Fantasy Illustrated are designed, except that every story is written by Alan and features a different artist. We think that this format is going to be an effective and innovative way of reaching new markets. The first few issues will feature work by artists Steve Skroce, Chris Sprouse, Brandon Peterson, Rob Liefeld and many more talented pencillers. We are currently in final negotiations with several talented folks eager to work with Alan Moore." Awesome intends to publish both Alex Ross Supreme paintings as posters and make them available to fans and retailers throughout the summer convention season. "Supreme is the best Superman comic currently being published"